Coffee and Roses - Life as an Eternal Optimist: It Started With a Kiss - here it is! Well, the day I've been waiting for months for finally arrived this week... Here is my very first printed copy of It Started With a Kiss! I've videoed the actual moment I opened the package to reveal my book - the vlog will be up tomorrow, so keep your eyes peeled for that! I can't tell you how truly, utterly amazing it is to finally hold in your hands a copy of the book you've worked all year on. It's magical. There's no other word for it. I'm always surprised by how everything seems to stop when I first see the finished book: it's like an almost reverent moment, mainly because for that one small moment in time, this book is mine - before it heads out into the big, scary world of reviews and publicity. I don't have children yet, so I can only imagine this feels a little bit like when a mum sees her newborn child for the first time. So many hours have gone into making this, so many late nights and frustrations and triumphs and sheer hard slog. And now, here it is: perfect and sparkly and every word in it came out of my head... How amazing is that?! The first reviews have come in for It Started With a Kiss - and they're both five-stars! 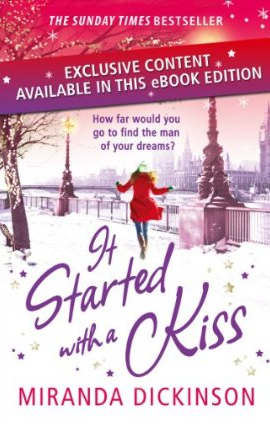 And the great news (which came as a complete shock to me last night) is that the Kindle/ebook edition of It Started With a Kiss is out TODAY! The ebook edition has lots of bonus content, too - including a whole load of deleted scenes from the book, with a commentary by me! So, it's finally happening - my baby is going out into the big, wide world... Scary but wonderful! Congratulations. The cover looks gorgeous. It's GLORIOUS, Miranda! I can't wait to read it. My Daughter (aged 18) and I love your books. She loves singing too and has been singing your song ever since we saw the book trailer and she is now downloading the full version. It's beautiful.